We’ve found the best backpack vacuum cleaner for you. Our #1 rated backpack vacuum is perfect for both commercial or residential use and excels at cleaning large areas as efficiently as possible. 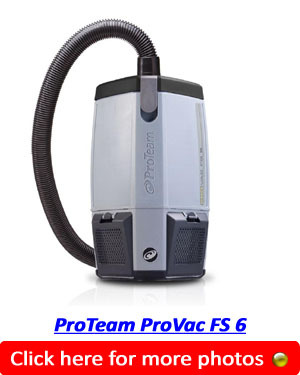 After hours of research, we choose the ProTeam ProVac FS 6 Commercial Backpack Vacuum Cleaner. 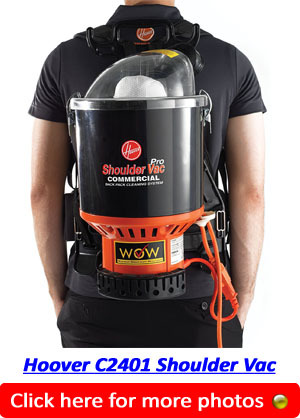 It is literally head and shoulders above the rest when it comes to commercial backpack vacuums. A top of the range backpack vacuum needs to lightweight so your back doesn’t get sore using it, quiet so you can use it without disruption and robust so it serves you well for a long time. It also needs to have a large capacity container for dust collection, be super efficient at cleaning over all surfaces, deliver great suction power and be able to cover a large area with ease. The ProTeam ProVac FS 6 ticks all these boxes as you will find out in my comprehensive review below. The ProTeam ProVac FS 6 features a 12-inch commercial power nozzle for any type of residential cleaning project. The vacuum can be easily maneuvered around the furniture in your home. The product is designed without brushes, belts, or beater bars for the ultimate convenience of the user. 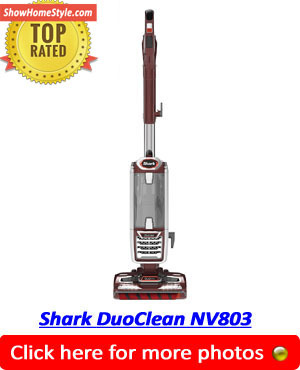 The design is quite durable compared to most of the other vacuum cleaners on the market. You can attach a myriad of tools to the vacuum cleaner for different cleaning jobs. This article provides a comprehensive review of the ProTeam ProVac FS 6 vacuum cleaner. The lightweight backpack of the vacuum is designed to improve indoor air quality, reach, and durability. It comes with a powerful 1108-watt, 9.5-amp motor that generates an airflow of 159 CFM and 96-inch static lift. The product is considered one of the quietest in its category with a noise level of 65.8 dBA. Improved lumbar support and heat dissipation are some of the other important features thanks to the adjustable FlexFit harness. The vacuum comes with a 50-foot long power cord to clean a large area without having to unplug the unit. The vacuum weighs only 11.6 lbs. Hence, you can easily carry the unit on your back without straining the back. A commercial cleaner can carry the unit around the workplace without fatigue. The unit circles air at a rate of 159 CFM in order to quickly clean your floors. The static dissipating hose has a diameter of 1.5″ and will give the user an excellent reach when in use. The kit comes with everything you need to get started when using the ProTeam ProVac FS 6. That is why a majority of users have rated the product highly. Many homeowners have stated that the vacuum is easy to use, powerful, great filtration, and quiet. That is why you need to invest in the ProTeam ProVac FS 6. Industrial and commercial vacuum cleaners need to be designed and manufactured with extreme attention to detail if they are to stand up to the rigors of extended use under sometimes harsh conditions. The Powr-Flite BP6P Comfort Pro by Deuter fits the profile of a quality commercial backpack vacuum. This backpack style vacuum system (which is also suitable for private use) boasts an ergonomically designed harness system making it more comfortable to use for extended periods of time. For added efficiency the unit features a five stage filtration system – including a HEPA filter. Those who choose this unit for commercial and industrial cleaning will be able to provide clients with peace of mind due to the Gold Certification from the Carpet and Rug Institute. The telescoping wand system and the stretch hose also makes it easier than ever before to clean efficiently by making access to hard to reach areas easier. The various accessories including the wand all store on a specially designed belt allowing the operator to focus on the job at hand and freeing up hands to provide a more efficient cleaning service. The Powr-Flite BP6P Comfort Pro has also been manufactured from impact resistant high density Polyethylene which enables it to stand up to the inevitable bumps and hard use that are part and parcel of the industrial and commercial cleaning business. Users have been been overwhelmingly positive about the unit with 73% of them giving it 5 stars. 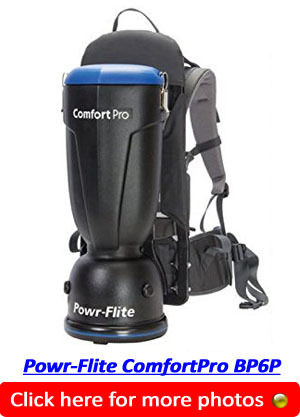 The Powr-Flite BP6P Comfort Pro was praised for the adjustable harness which can accommodate even those with smaller frames, as well as the ability to use the various attachments to reach hard to clean areas. It also received high marks for the quietness of operation. All in all a great choice for those who want a backpack style vacuum cleaner. Some smaller users did have a reservation about the weight of the unit (12 pounds). Full of all the features that a professional or a skilled amateur would enjoy, the Bissell BigGreen BG1006 is definitely one of the best offerings at its price range. When it comes to reviewing a product such as this, we typically want to focus on the most important things. What are the most important things? The features and benefits, the testimonies of people who owned this product and how it compares to other offerings at the same price level. When looking at the Bissell BigGreen BG1006 the best information about this product comes directly from its description by the manufacturer. Within this description you will find a set of features and benefits, as well as specifications that allow you to know what it is all about. When looking into the features and benefits, you have to pay attention to the things that really matter. When it comes to a high-level canister vacuum canister cleaner such as this, you need to have a very high power motor, you also want to have a long enough hose to make it usable. You also want other features that make wearing it easy to do. The above concerns are addressed by the 1080 watt powerful Amtek motor and a long 4 foot hose. Other creature comforts that are added to make it a lot easier to use are a combination shoulder strap and waist strap unit that makes it very easy to carry around. Although it only weighs 9 pounds, wearing 9 pounds on your body without such a sophisticated strap system would be difficult but with the added shoulder and waist combination strap it is very easy to use. Another problem that the manufacturer solves is overheating. In the average commercial canister vacuum cleaner, there’s always a risk of overheating. This typically happens when the collection bag becomes full and the motor can no longer take in enough air. This is mitigated by a heat sensor that will turn off the motor when this condition happens. This ensures a very long life and a high level of reliability to anyone who purchases this particular canister vacuum cleaner. It utilizes an easy to remove swivel lid to quickly remove any waste. The 4 foot hose comes with a wand with swivel cuffs on it for ease-of-use and for extra dexterity. For mobility it comes with a 50 foot power cord allowing a user a lot of distance between the outlet and the area in which they need to use the vacuum cleaner. It comes with a nine tool cleaning kit allowing it to handle just about any situation. It has a capacity of 6 quarts so it can handle both big and small jobs alike. Having a 4.9 star rating on the most popular e-commerce website, it immediately tells anyone that this is a product that the majority of purchasers really enjoy. When reading over the reviews that have been left behind there’s a common thread, people enjoy the high power motor and how it can pick up just about anything. They also like that the bag has a replaceable unit so it is built to be used for years to come. It is also highly reviewed because of its portability and ease of use. The Hoover C2401 commercial backpack vacuum cleaner is a lightweight, corded, tool that is designed for superb mobility while your cleaning. Great for maid services and other house cleaning businesses. The harness which was designed by a chiropractor for reducing backstrain allows you to carry the 9.2 pound C2401 around without hurting your back. 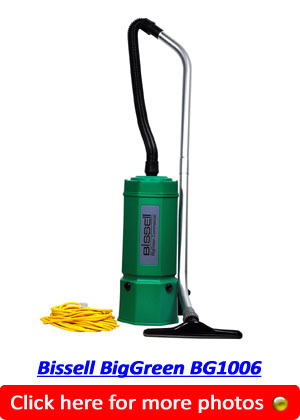 With the extra long 48 foot industrial power cord and reasonably quiet 66dBA motor, the Hoover shoulder vac is ideal for cleaning larger areas such as offices, hotels, guesthouses and libraries. Another great benefit the C2401 has to offer is Hepa filtration which allows you to keep airborne allergens to a minimum whilst vacuuming. There are also no bags to replace as this commercial backpack vacuum is bagless saving you a fortune in maintenance costs. Included in the box is an accessory pack with a 4-inch upholstery tool, 11-inch turbo floor tool, 2-inch dusting brush and a 6-inch crevice tool. Although it doesn’t market itself as a pet vacuum, this top rated backpack vacuum will pick up pet hair from hardwood floors, low pile carpets and area rugs as good as any other cleaner. The HEPA filter does a good job of keeping the airborne allergens released by pet hair from escaping back into the air during vacuuming. Backpack vacuum cleaners for residential use have rapidly gained a following among home users who want comfort and convenience – but also want to enjoy a vacuum cleaner that delivers as far as power and ease of use are concerned. 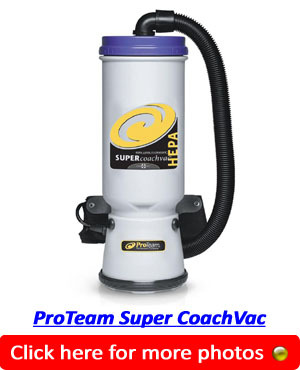 The ProTeam Super CoachVac delivers in all of these areas. The advantages of this vacuum cleaner are almost too numerous to mention – however users who want versatility will not be disappointed. This is a commercial backpack vacuum cleaner that will do it all. It will allow the homeowner to clean tiles, hardwood floors, carpeting, furniture and even ceiling fans and other fixtures. As an added bonus it features a simply enormous 10 quart filter which makes it enormously efficient – in fact the manufacturer claims that the system is up to 43% more efficient at removing soil than comparative models from other manufacturers. This is an enormous positive for those homeowners who have pets who track dirt into the house on a regular basis. The washable bag also adds to the attraction of the vacuum cleaner – it allows the homeowner to save significant amounts of money replacing bags on a regular basis. Of course the other advantage is the lightweight construction of the backpack vacuum cleaner. For those with multi story homes this goes a long way to eliminating the back breaking work of carrying traditional upright vacuums up and down stairs. User surveys have shown that the vacuum cleaner enjoys a 75% approval rating and that users are extremely complimentary about the comfort of the harness system, as well as the sheer power of the suction that is supplied by the ProTeam Super CoachVac. 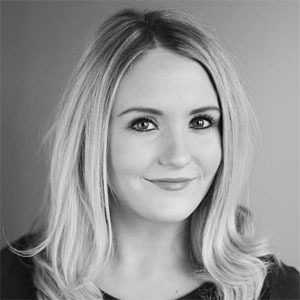 One of the only reservations expressed is that users need to take care not to scratch hardwood floors when using the unit – but a ProTeam 14 Hard Floor Tool should sort that issue out. This vacuum cleaner represents excellent value for a premium machine and homeowners in search of superior performance should certainly give it a second look.